We can freshen up an existing site, add major new functionality to your website or just make minor updates to your current site to keep your business growing. We are happy to assume maintenance on a site developed by someone else. No site is too small and no update is too small. With two staff members with Master's Degrees in Computer Science, Duke City Software is perfectly positioned to handle your website maintenance needs. We are competent in a variety of programming languages, so the chances of us being able to maintain your site are very good. Our market niche is website technology and custom programming. In addition to making routine updates, we can update your website such that mobile users have a different experience from computer users. The same content is displayed differently depending on how the website is being accessed. We can integrate existing open source functionality into your website (like blogs, slideshows and calendars), or we can create software applications from scratch and integrate them into your website. We can also create special landing pages for your promotional materials with QR codes. Whatever you need, we can provide it for you. We are very willing to work with your project manager, content writer, advertising or PR firm or social media consultant. Our goal is for you to be a happy customer. Most of our customers come to us from word of mouth referrals and remain satisfied long term customers. We'd love to talk to you about your website. Please call (505) 821-1522 or email general@dukecitysoftware.com. Debbie's Creative Moments has been a long time customer of Duke City Software. When Debbie was ready to update her site, she asked Duke City software to redesign the home page and make only minor modifications to the interior shopping cart pages to freshen up the look. The new site looks modern and aesthetic and incorporates social media seamlessly. 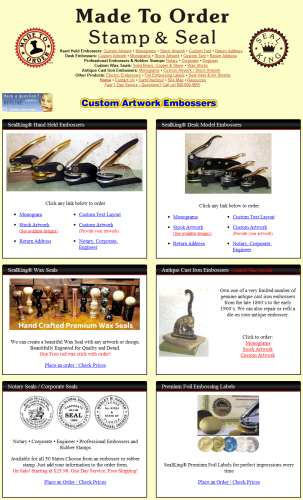 Custom Embosser Pro uses a custom shopping cart developed in PHP by another developer. Duke City Software assumed maintenance of the site making shopping cart changes when requested. We work with the existing code and consolidate pieces of the code when it's cost effective to do so. We have added navigation capability, a blog and on-line chat, updated the look of the pages, added the capability to capture credit card information, added many new products and updated prices, added the shipping cost calculation functionality and are in the process of integrating sales from this site with Quickbooks. This site is an online store that uses a flat file shopping cart installed in the early days of the internet by another developer. Duke City Software maintains the site. We have updated the site navigation and the look of the home page to meet the customer specifications and have added an on-line chat capability. We also work with the existing shell code and flat file database to make product and price changes when requested. 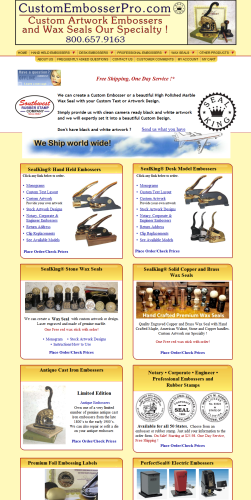 We have added many new products and are in the process of integrating sales from this site with Quickbooks. This site was designed and developed by another website firm. We have assumed maintenance of this site. Since it's a financial services website, all changes need to be approved by a broker/dealer before we make the changes live, so we segregate the changes so only our client and the broker/dealer can access them until they are approved. This site is implemented using the Drupal content management system (CMS). Duke City Software implemented the design in Drupal and developed the custom code to display the text for each piece of the "client pie." 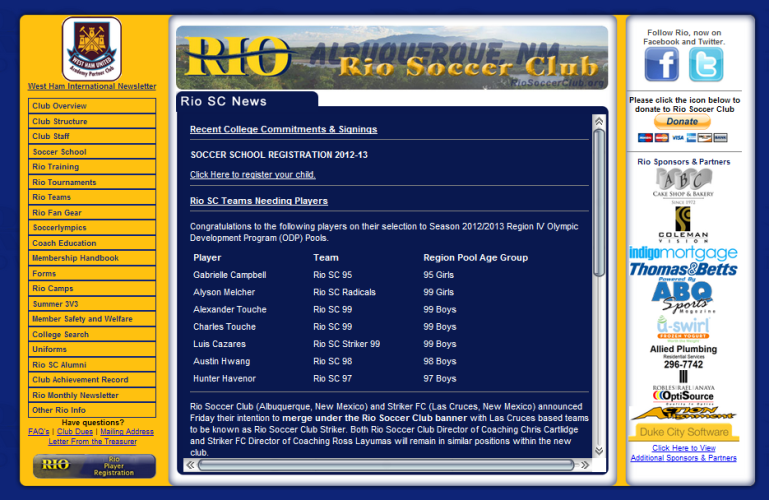 We make regular monthly updates to this site for Rio Soccer Club. 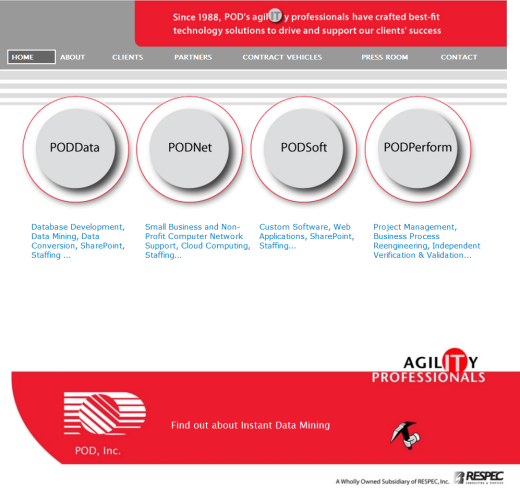 We also redesigned their site during Fall 2012. If you have an existing website, we can update it for you. We don't charge any monthly maintenance fees. You are only charged for the time we actually work on your site. Our fees are $100/hour for text and image updates and $125/hour for programming and styling updates.